Eight Division I drum corps stepped off onto the University of Missouri's Faurot Field Sunday, July 29 at the DCI Columbia event, performing shows of exceptional excitement to the thousands of fans in attendance. The Blue Devils (92.250) won the competition, maintaining their lead ahead of Phantom Regiment (90.350). The Colts (82.650) came in third place, keeping their distance from Spirit from JSU (80.900). "We had a really great show tonight. It was much cleaner than it has been in the past and everything really came together during our performance," said Dee Casper, drum major for the Colts. "This season has just been very exciting, and we're going to keep bringing the fans great shows and lots of performance energy until the end." 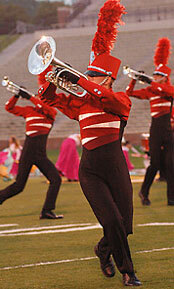 Also performing at tonight's competition in Columbia, Mo. were the Blue Stars (79.950), Madison Scouts (78.750), Southwind (75.150) and Pioneer (71.000). After this weekend competition's, every corps will start putting the finishing touches on their shows as they make their way to Rose Bowl Stadium in Pasadena, Calif. for the 2007 World Championships. But as the corps' competitive placements have been varied the entire season, a clear winner will almost certainly not be found until the World Championship Finals on Aug. 11. View the complete scoring recap.